Hi friends! It is a delicious lentil made with tomato and spices. 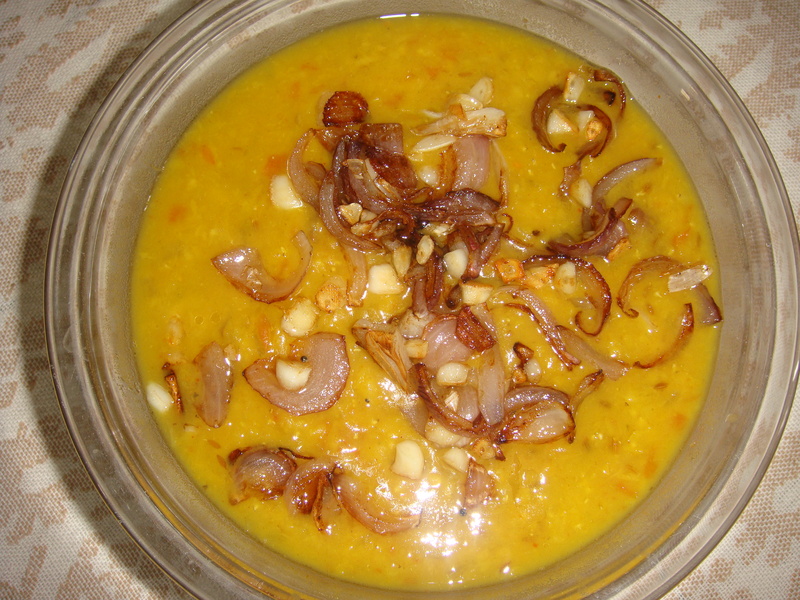 Masoor dal can be cooked in the combination of various other vegetables such as beans, cauliflower, green peas, etc. also. Wash the masoor dal very well, soak in 500 ml water for fifteen minutes. In a pressure cooker, take Olive oil heat add cumin . When cumin starts to crackle, add asafetida fry for a few seconds, till it is light pink in colour. Add the chopped onions, add the tomatoes, fry for 3-4 minutes. Add coriander, turmeric, chili powder, fry for few seconds, add soaked dal with water, salt and close the lid, cook on high flame, after the pressure is formed, reduce heat to low flame, cook for one minute only. Cool the pressure cooker to room temperature. Open the lid of pressure cooker, take out the dal in a medium size bowl. Heat the ghee in a pan add the sliced onions sauté for 4-5 minutes, till light golden. Add the finely chopped garlic, fry for 3 to 4 minutes, add gram masala, fry for few seconds. Put the above tempering in to the dal . Serve hot, garnished with chopped coriander. It is very delicious spicy dish. Serve with all Indian breads or boiled rice. Packed with protein, fiber, iron, folate, and other important nutrients, lentils are the storehouse of nutrition offering you numerous health promoting benefits and longevity as well.Masoor dal is an ideal food addition to your weight loss diet because it is low in fat and contains high amounts of fiber. Eating fiber rich foods controls your appetite by giving you the feeling of fullness which lasts for a long period of time. Masoor dal helps in loseing weight, protects the heart, and is good for diabetics. Red lentils improve digestive health, reduce cancer risk,boost your immune power,reduce inflammation,and are healthy for eyes.Red lentils boost energy,and is good for strong bones and teeth.